At WWDC Touch Arcade had the opportunity to interview Gameloft President and CEO Michel Guillemot concerning his views on iPhone gaming and what the announcement of the new iPhone 3G S means to his studio. 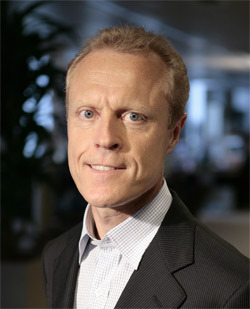 Guillemot’s involvement in the game industry began with the formation of Ubisoft Entertainment by him and his brothers in 1986. Ubisoft quickly became a very successful publisher as gaming evolved into a major industry. But as Guillemot tells it, he longed to get back to the days of home computer gaming, when people owned a computer primarily for reasons other than gaming, but would engage in casual gaming as a matter of course. Seeing the rise of the mobile handset, which he (correctly) believed most everyone would soon be carrying, Guillemot saw an opportunity to provide games in a model analogous to the home computer days of old. And so was born Gameloft in 1999. The highly successful Gameloft of 2009, with 4,000 employees worldwide, develops games for around 1,200 different mobile handsets as well as most major home and mobile consoles. But Guillemot makes no effort to hide his particular excitement for Apple’s iPhone platform. When Steve Jobs announced the App Store and the business model, I said they are going to do as well on the App Store and on the business model as what they did on the iPhone itself, which is creating something which is quite mature, quite balanced, quite sustainable in the long run. And that’s why, as a company, we decided to really invest and support it, because it was, to me, really a kind of very advanced thinking to have these three elements [iPhone, iTunes and the business model] connected and together, reaching consumers with a very comprehensive approach. So, I think it was very much 21st century in the making and a clear cut from anything we had seen so far. In his view, Apple set the tone for the mobile gaming device of the 21st century. What I think is that two years ago, handset makers and carriers were a little bit lost. We were telling them that they should bet on the game side — to make sure that the handset would be game friendly. But, for some reason, they were not. And then Apple came and convinced many people — the right way: see, it works! And now what we see is that everyone is trying to emulate them. Apple came from outside and took the lead…. And so I expect that, in the race where the leader is still running and still accelerating [ laughs ], it’s challenging. Because, if they already overtook you and they’re still accelerating, you really have to consider that seriously if you want to remain in the race. And while he is dedicated to supporting the newly emerging units that seek to surpass the iPhone, he points out that for gaming those companies are at a disadvantage. The just-launched Palm Pre, for example, Guillemot considers to be a nice device, but feels its webOS HTML5 development model puts it just about where the iPhone was for gaming before the SDK was announced. The Android devices, he feels, also hold less promise for gamers as compared to Apple’s device. Android is Java … Java takes two-thirds of the power. So, when you drive a car – if you take the same car with 1/3 of the horse power, you will not have the same experience. Guillemot was pleased by Apple’s announcement of the iPhone 3G S on Monday and is eager too see what advancements the new hardware will enable for his studio’s games. And while he feels the more capable device will raise gamers’ expectations and make the coming year more challenging than the last for iPhone gamemakers, he appears to be rather undaunted. Perhaps no surprise from a man whose studio creates games for most every mobile platform on the planet.